The Dining Room at Blithewold has always been a place where fine meals have been served to cherished guests. Today friends gather and exchange stories while delighting in a cup of tea, freshly baked scones with sweet cream, and a 3-tiered tray filled with sweet and savory treats. Simply luxurious! We invite you into Blithewold’s Dining Room for Tea. Come in, sit down, relax, and enjoy the moment. 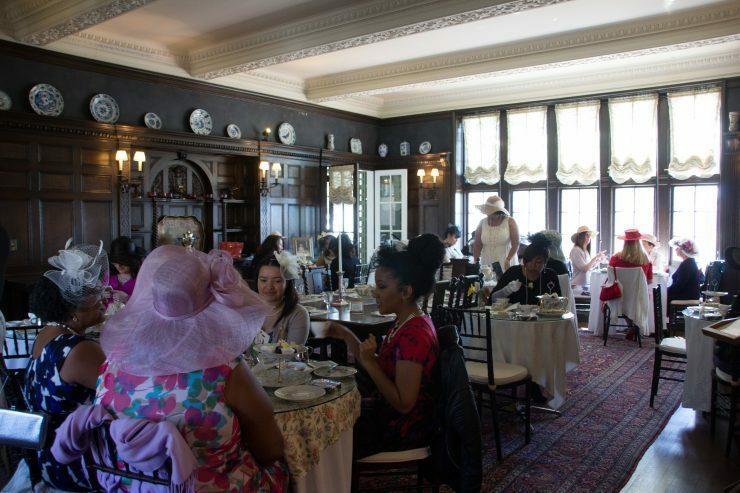 The price for Tea includes admission to the Mansion and Grounds, so be sure to leave time for touring! Our teas are served by and largely prepared by Blithewold’s volunteers. We have a limited ability to accommodate vegetarian diets as well as nut and celiac allergies. Please specify when making a reservation. Unfortunately, we are unable to take individual payments for each member of a group. Payment must be made for the entire party at the time of registration to reserve the properly sized table for your party. Additional information can be found on our FAQ page here. Our teas fill quickly and are by pre-paid reservation only. Click on a date below to purchase your seat for Afternoon Tea. This list is updated Mon-Fri.
After May 10th, we will not have Afternoon Teas again until November. Become a member and receive early exclusive notifications when Holiday Tea reservations are open. Join here!